The sun pierced the old man’s pale blue eyes despite the brim of his grey hat. The frayed hem of his grey robes rustled last year’s crumbling underbrush, as his quick steps pressed into the carpet of damp decaying brown leaves. Yellow beaked blackbirds swooped low and chortled at his invasion of their woods so near their nest of chicks. Towering oaks and maple trees crowded against the single-track trail zig zagging lazily up the sunbaked side of Mount Klymene. Abbernak giggled at the silly little feather heads and kept his pace steady toward his ramshackle home. For home was where he was bound, even if it was only for a moment. The rest among familiar smells and sounds would do his body and mind good. Stopping at the edge of a small clearing, Abbernak listened. A redtail hawk screeched and dove after a cottontail among the purple and white wild flowers. The emerald green leaves rustled in the breeze. Abbernak scanned the world that stood before him and stepped into the clearing. His tree was cuddled against the bend of a sparkling creek. The melody of water over the smooth stones reminded Abbernak of quieter times long past. He turned and again scanned the clearing, never can be too careful these days. 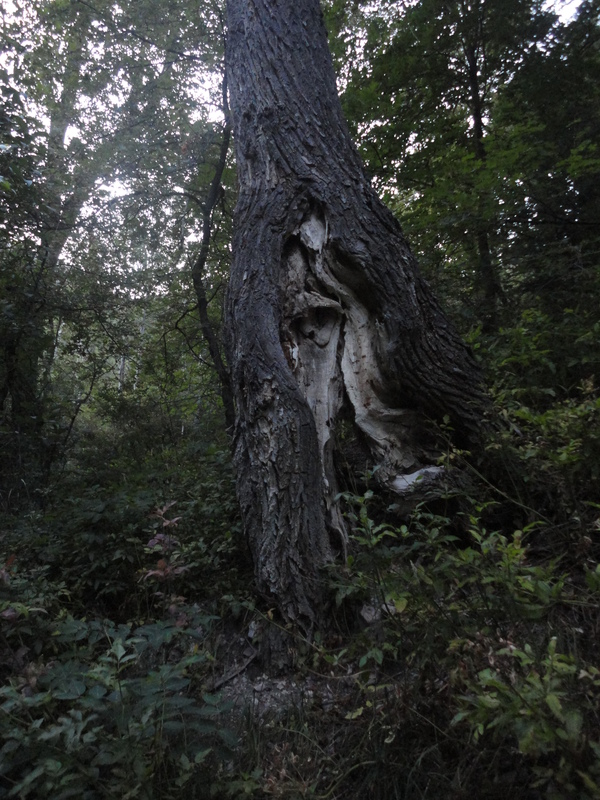 A glint of light lashed out of the ancient gnarled trees causing him to freeze. Standing stalk still he listened, the morning birdsong continued to drift among the branches, and the far off rustling of creatures scavenging the underbrush reached for his ears. Shaking his head, he placed a wrinkled hand on the equally wrinkled bark of the tree. Closing his eyes, he whispered the familiar magic words, and stepped into his home. A wooden staircase wound its way into the earth. With each confident step of Abbernak’s feet the luminescent moss clinging to the walls of the corridor brightened. At the bottom of the stairs stood a walnut door.It swung open without a sound. He stood there a moment and breathed in the sage, rosemary, and cedar. A simple straw mattress lay to one side of the room along with four trunks, which contained mostly leather bound books filled with yellowed pages of elemental spells and creature conjuring. From one of his many pockets, Abbernak pulled a set of small black iron keys. He fit one into a trunk. Neglected hinges gave a sigh of relief as he rested the lid against the wall. He was sure that the book he needed was in this trunk. One after another, the books rose from the trunk and rested on the floor in a neat stack. There it is, he thought. The deep crimson book with a charcoal eight pointed chaos star imbedded on the cover stared back at him. I never thought I would need you, he thought. At least I had hoped I would never have to turn your pages in more than a casual interest. Times had changed indeed, if a son of neutrality was willing to sink his mind into pandemonium for a mere chance of a better life. Perhaps he was mad, as all the other wizards of his order believed. Madness had a certain strength about it, for within madness was creation and destruction dancing hand in hand. Abbernak sat upon the dirt floor, picking his teeth with a bit of stick contemplating the runes on the delicate pages. The runes skittered across the page until he placed his bony finger in the center and spoke an ancient word. He spent many hours hovered over the book. Page after page of spells swirled in his mind like a whirlwind. Thoughts careening into one another and weaving intricate nonsensical patterns that threatened to strip his grip on reality all together. A crack like that of lightening striking a tree reverberated within his skull. Abbernak sunk to his knees, yanking at his matted brown hair, and choking on his own saliva. Then there was silence so deafening, Abbernak thought his ears were stuffed with wax. A darkness descended upon the forest like a fog as thick as amber tree sap. Abbernak had not noticed until now that he was holding his breath. He let it out and began to climb the stairs to the surface. The moon shone upon the world in a solitary beam of white light in the small clearing. He felt her presence before he saw her watching him from the shadows. The deep-set feline eyes of the necromancer sent ice dripping down Abbernak’s spine. “All your brothers have fallen before me, begging for their souls,” she purred. “You’ve tipped the scales too far, Nightlark,” Abbernak said, a hint of sadness creeping into his baritone voice. “Then you have already failed, because the Shadow realm has made a snack out of the Light.” She stepped into the clearing. Purple robes gently waving in the fog surrounding her. Her golden eyes began burrowing into his heart. He gagged and fought for air. At last, she withdrew laughing. “What is left for you now that your precious balance has been devoured?” she asked as she sent black mass of nebulous smoke gliding in his direction. He moved toward the heart of the clearing. His body was relaxed and his mind quiet. His eyes flashed sapphire and green flames crackled in his hands. The flame arched and morphed into red lightening, and then contracted like a coiled snake. All the air in the clearing pulled into center. The fabric of time was wrenched open and chaos spread its great webbed wings. Nightlark’s voice escaped her and her golden eyes locked on Abbernak. Thunder rumbled across the deep grey sky as the tree wizard released Chaos into the world. Next Article Believe the impossible is possible.